Reviews – Words Are My Life . . .
It’s taken me a while to figure out what to write in the review for this story. Not because it was bad, on the contrary, because it was so good! I wanted to be able to do it justice. It’s a very original plot, at least one I’ve never run across before, and I really enjoyed it from the first page. The Antichrist, Nathan, is one of those characters that you feel you actually know. He’s a typical teen that has the uncanny ability to charm his way out of trouble, most of the time. He enjoys hanging with his close friends, he routinely gets picked on by bullies, he gets along pretty well with the teachers at his school, and he has a pretty good relationship with his family. The only thing in his life that causes him pause, besides the bullies, is that he’s adopted and occasionally mentions wondering about his real parents. He takes it all in stride, though, and doesn’t feel as though his life is lacking in any way. For the most part, he appears to be well-adjusted with a great, snarky sense of humor. Feeling this way about Nathan, I had a problem knowing he was the Antichrist in the story. I wondered how the heck he could be something evil when he seemed to be so sweet. As the story progresses, the author explains their version of the Antichrist as not being evil so much, as being the Uniter of the survivors after the Apocalypse. This put a totally unique spin on the concept of the Antichrist for me. Now, I’m not saying there’s not some badness going on there but I don’t know that evil is the word I’d use to describe it. I’m not one to include spoilers in my reviews, so I’ll just say that the journey from the explanation of Nathan being the Antichrist, and the end of the book, is one hell of a ride. There were so many twists and turns I stopped trying to anticipate where the story was going, and just enjoyed it. It was definitely worth the ride! I read the last page with some disappointment not knowing when the next installment was due to be released. I sure hope it’s soon! Goodreads | Charli Denae Mercer’s review of Antichrist 16: The Becoming. I did not see that coming… at all! I’m feeling very mixed about this story. It’s really long and kind of flops back and forth quite a bit. Just when you think it’s going to wrap up, some other epic thing happens and it keeps going. Now, this is not really a bad thing, it’s just that there were a few places where I questioned what was happening and was almost getting mad at the characters and thinking, ‘Enough already!’ When I got to the end, which knocked me for a loop as I did not see it coming, at all, the aforementioned complaints became completely clear. I discovered the reason that the plot seemed to go back and forth so much. I also was right to question what was going on. I just didn’t know it at the time. That being said, I seriously could not put this book down. It kept me intrigued and involved throughout. The main heroine, Abby, brings the reader over to her side pretty quickly. After a terrible tragedy that crushes her spirit, her family is convinced that she’s cracked mentally. She labors to convince them that she’s not crazy through the entire story and, when she finally has evidence that she’s telling the truth, the entire thing blows up in her, and our, face. I’m not going to give the ending away but, let me just say that, if you see it coming, you’re a lot smarter than I am, because it caught me entirely unaware! I’m usually pretty good at figuring out what’s going to happen in movies and books, too, but not this time. As I read the last word, I just kind of sat there for a minute to let it digest before turning my Kindle off. It was like the sun coming out from behind the clouds. Everything was suddenly clear! I think I actually said, “Wow” out loud. LOL!! This is where my feelings are mixed. Though I obviously enjoyed the story, a part of me was a little disappointed at the ending but, another part of me was awed that the author had the guts to end it the way that she did. 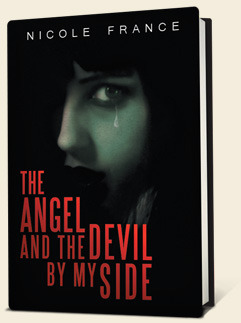 If you like paranormal stories that include angels and demons, you’ll love this story. If you like dramatic stories that involve heroines with personal dilemmas to solve, you’ll love this story. If you like stories with a ‘I totally did not see that coming’ ending, you’ll definitely love this story. I received this story in exchange for an honest review, and I honestly can say that I would spend the money on it, to read it again.